If you have a common question, most likely the answer will be found below in our Frequently Asked Questions. If, however, your question and answer is not listed, feel free to contact us through the contact form. I am not in Holland, can I still order? How are the products packed and sent? My shipment has not arrived yet, when will it arrive? The product I orderd is not available anymore. What now? The product I was looking for is not available on Yummy Dutch. Can I still order it? I would like to return the products and get my money back, is that possible? Will I be charged VAT / GST ? What does net and gross weight mean on the website? I just created an account, but I cannot access it at Yummy Dutch, howcome? For sure, our webshop is built to especially serve people outside of Holland, who love Dutch products, but cannot obtain them in their country of origin. It doesn't matter where you live, US, Australia, Japan, or even UK or other European countries - you can always order the products from our webshop. We are currently using Post NL for the delivery. They send shipments throughout the entire world on a daily basis. You can check pricing and transfer time information on our shipping page. Any other country that is not listed there, will automatically be grouped into the WORLD delivery table. In short: it doesn't matter where you live, we can ship it to where-ever you are. We use cardboard boxes to send the goods. Depending on your order size, you'll get a smaller or bigger box. Stuff that can break is wrapped in a thick layer of bubble wrap. Any empty space is filled with filling paper to make sure the goods cannot move too much in the box. It can take quite long sometimes for a shipment to arrive. On our shipping page you can check the transfer time per country. However, often it takes much longer than what Post NL indicates. For instance to the US, instead of 4-8 business days, it can easily take up to 20 days before your shipment arrives. This is due to customs who sometimes keeps packages longer than expected. Therefore please allow 30 days for a package to arrive. In some cases the packages get confiscated by customs. Usually customs randomly check packages to check the contents. If it is a product that is not allowed to import, they will seize the products and destroy them. It is up to the buyer to figure out beforehand whether or not certain products are allowed to be imported in their country. In some cases you have ordered a product, which turns out not to be available anymore. In these cases we will pack an even or higher valued product. In other cases where there is no other products available for that either, we will contact you and communicate to find out which product you would prefer to have instead. The product I was looking for, is not available on Yummy Dutch, can I still order it? For sure you can. 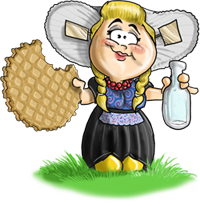 If you know a specific Dutch product that you would like to order, please let us know through the contact form and we will add it to our assortment on the website, so you can order it. Our webshop only sends out perishable goods. Therefore we cannot take back products. Because we are European (Holland) based, we are obliged to charge VAT only to European member countries. If however you run a business within the EU and are buying these products for your company, you can fill out your VAT ID in your account information page (or when you create an account), so you will be charged 0% VAT. If you are a customer outside of the EU, you will not be charged VAT / GST. For some products, like glass jars of peanut butter, the glass weighs almost half or more of the contents of the product itself. Therefore, when we send an order we add the gross weight of the products to find out what the total shipping weight will be. We also include the weight of the wrapping material at the end of the process to make sure that the order fits into the correct weight group. After you have created an account, you should have received an email with a confirmation link. You must click this link to verify your email address. After verification has been completed, you will be able to access your account. If you have not received the confirmation email, you may wanna check your spam folder to see if it is there. In case you clicked the link and it didn't work, or you have not received the email altogether, please contact us and we will manually activate your account. Our shipping and handling is handled by local Dutch company TNT-Post. They are professional, reliable and everything is tracable. Use the table above to see how much it will cost to send your package to your country. The bottom table shows the layover time.